The 50-minute without an intermission performance began with Akram  trying to troubleshoot his mobile phone’s calendar. He called the help center, only to learn that he was speaking to a twelve-year-old child in Bangladesh from Europe! The questions triggered Akram’s recount of his first trip to Bangladesh and from that emerged memories of his father, who worked as a cook both in his Bangladeshi village and restaurant in London. His father, a hardworking man who earned his living with his two hands, disapproved of his son’s frivolity. Akram then spoke fondly of his mother, who often stepped in as the mediator. Instead of finding him unmanageable like the father (“Akram, why can’t you sit still!”), his mother would ask him to sit in front of her so she could tell him a story. And what a story she told him, that of the honey hunter’s son, forest goddess Bonbibi  and demon king Dokkhin Rai . Moving through memories, childhood and adolescent, the plot culminated when the 16-year-old Akram must make a decision about his future: Should he be a cook like his father or should he pursue his passion for dancing? Here, two white chairs appeared onstage. The chairs were identical, with the exception of one was significantly larger than the other. The smaller chair was the chair that Akram refused to sit still on as a child. Then, he danced, ran around, crouched under and jumped over the chair with absolute ease and abandonment. But the same chair, now much larger, seemed unconquerable years later. Indeed, dreams come as second nature to children. And how easy those dreams of one becoming an astronaut, explorer or actor/actress are to a child! The dance with the two chairs carried across self-doubt and fear. But as Akram attempted to, and succeeded in getting onto the large chair, his helplessness turned into curiosity. He rolled one direction and then the other, exploring the surface of the chair in relation to his body. He peeked out from the left, from the right and from the top, even looking out upside down. And how’s the view from the larger chair? Not too shabby I would think. Akram informed his father that he wished to become a dancer. The dance with the two chairs represented Akram’s internal struggle, and the dance following his declaration represented resolution. The liberation was complete as the audience watched Akram spun with absolute joy. There are so many moments to love about the performance, and even more moments of sublimeness to treasure, including the dance of the father (Akram painted a face on his shaved head and danced the entire section looking downward at the floor), the use of light and shadow to tell the honey hunter story and much more! With early training in the Indian classical dance form Kathak, Kanh moved with absolute fluidity, ease and grace – even his fingers were part of the visual storytelling! Bravo Irvine Barclay Theatre for bringing an amazing artist! Can’t wait to check out Akram Kanh Company when I next visit London! 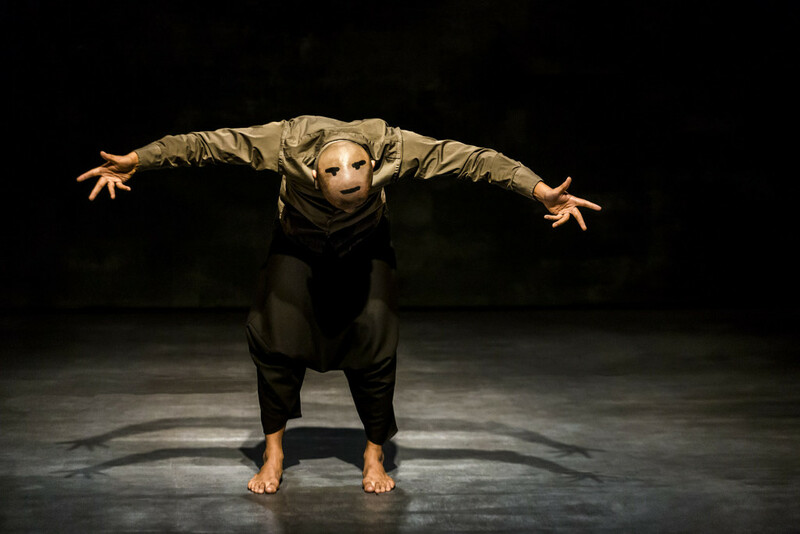 The choreographer/dancer and the character in the performance shared the same name, hence the former Akram Kanh is referred to as Kanh and the latter as Akram. Bonbibi, worshipped by Hindus and Muslims alike, is the forest goddess who protects woodcutters, honey gathers and others who enter the forest from tiger attacks. Dokkhin Rai is the demon king and archenemy of Bonbibi, he sometimes disguises himself as a tiger to attack humans.